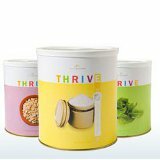 One of the big problems people run into with food storage is where and how to store their water. You need a lot of water. 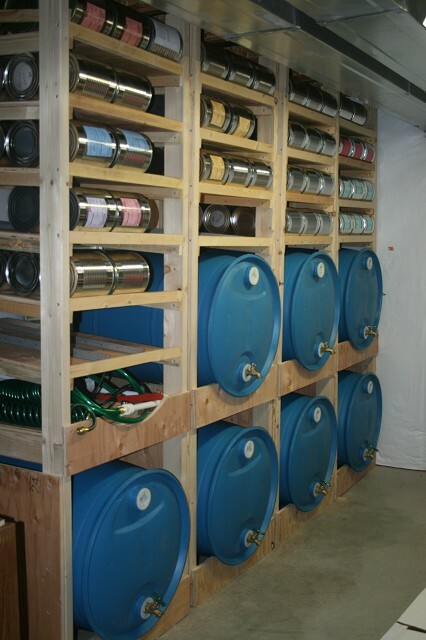 FEMA recommends that you store at LEAST 1 gallon of water per person per day. I personally think that you need more than that. An reasonably active person needs to drink ½ gallon of water each day, so that leaves ½ gallon, for washing, cleaning, sanitation etc. Not very much. Let's take a look at how A and B solved this problem. These shelves are designed and built by A and his wife B. 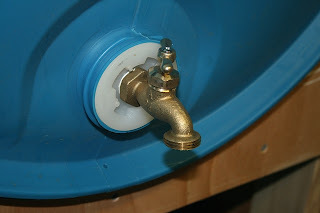 They have very graciously made the FREE plans and a TON of great photos available on their blog: http://waterstoragerack.blogspot.com/ the FREE plans are available through a their blog, go check it out. 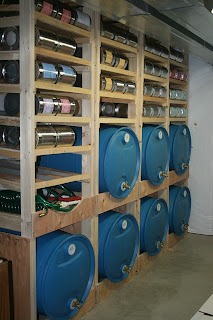 How this awesome water/food storage shelf come to be? 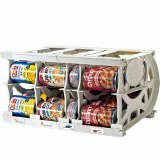 We thought it was a genius idea and made some changes to the design and also added shelves to the wasted space above them to include a can rotator. My husband loves to do this kind of project so he was quick to pull out his CAD software and get to work figuring out the best way to do it. When we finished it, I posted some pictures on Facebook to show it off to my friends/family and I had tons of requests for instructions of how to do it. We ended up making a little blog so that anyone who wanted the plans could have access to them. Where is this located in your house? It looks like maybe a cold storage, or a basement. We live in Colorado and have an unfinished basement. How many #10 cans does each shelf hold? 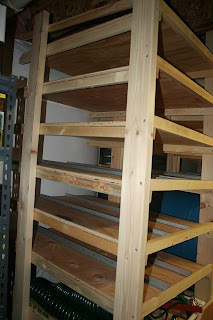 On a scale of 1 (easy) - 5 (professionals only) how hard is it to build this shelving? 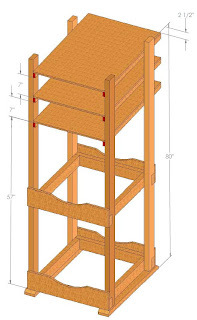 What tools are needed to build this shelving? Are there any specialty tools that are necessary/handy to have? 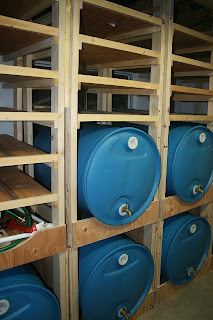 Have you had any problems with water leaking from your barrels? We had leaking in one barrel. This was not due to poor design but rather due to overtightening the hose bib into the bung and it cracked it. All we had to do to fix it was replace the bung. How long did it take you to build (not the designing just the build)? It took 2 full (long!) days of work to build all four of our units. We were able to do it in an assembly line manner which cut down on time. Doing all the cuts first, then the assembly. Thanks to A and B for sharing! !